It’s been nearly 4,000 years since the first lock was discovered. Near Nineveh in the Khorsabad palace ruins, it’s considered, as of now, the oldest lock to ever be found. The lock was made of wood and functioned to secure the door with a large wooden bolt. The bolt had a slot with several holes, which contained wooden pegs, that prevented it from being opened. This lock preceded the tumbler lock, which is a common lock used today. As we share a brief history on locks, consider Firstline Locksmith in Trenton for your locksmith needs. Instead of searching “locksmith near me” or “locksmith nearest me”, give us a call. We’ve been serving Trenton and the rest of New Jersey for more than 25 years. From ancient Egypt to Rome and beyond, locks were used to secure and protect belongings and possessions. The warded lock was a common type of lock used throughout antiquity, and its type of function is still in use today. All-metal locks have been reported to be used as early as the mid 800s a.d. Romans were known for keeping records of their existence, which led historians to discover that Romans wore the keys to their locks as necklaces or as rings. The metal locks Romans used were for doors or chests. 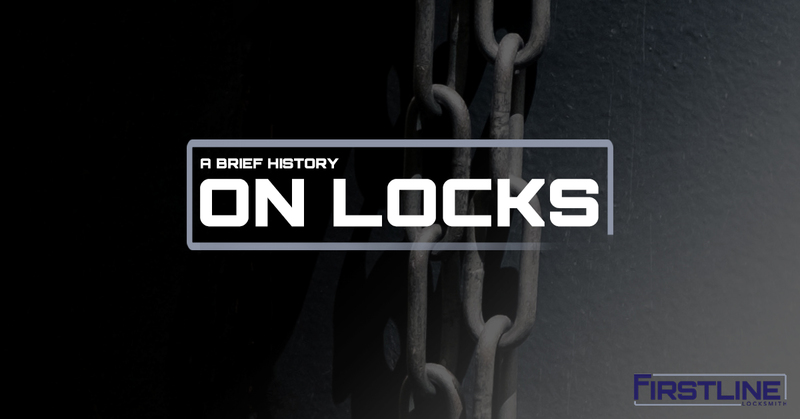 Through the 18th and 19th centuries, locks got an upgrade. As technology advanced, so did lock mechanisms. The advancements added security to possessions and belongings stored behind a locked door or beneath a locked lid. Over the course of about 200 years, America began manufacturing and producing their own locks, which led to more exportation of locks than importation. The modern pin tumbler lock was birthed during the Industrial Revolution. An American physician, Abraham O. Stansbury, holds the patent for the earliest version of the double-acting pin tumbler lock, which he secured in England in 1805. As advancements and innovation continued, the American Linus Yale, Sr. invented the pin tumbler lock in 1848. As proud members of Associated Locksmith of America (ALOA) and Safe & Vault Technicians Association (SAVTA), and The Society of Professional Locksmiths (SOPL), Firstline Locksmith is committed to delivering the best locksmith services in Trenton and greater New Jersey. If you’re in need of a locksmith, don’t search randomly for “locksmith near me” on your phone. Give us a call now, and we’ll work to take care of your needs. We’ve got 25 years of experience to back our services and customer satisfaction.